The latest episode of New Japan’s The Wire has posted on YouTube and it features the winner-take-all tag team match set for the upcoming G1 Supercard in Madison Square Garden on April 6. The match pits The Guerillas of Destiny, Los Ingobernables de Japon, The Briscoes and Villain Enterprises in a 4-Corner Survival Match..
Tama Tonga and Tonga Loa of the G.O.D will put their IWGP Tag Team Championships on the line. Villain Enterprises’ Brody King and PCO will also bring their hardware, the Ring of Honor World Tag Team Championships. Both sets of titles will be up for grabs on what could be the most important night for both companies in the United States. Jay Briscoe originally made the challenge on February 23, when he and Mark were still the ROH World Tag Team champs. Tama and Tonga accepted, but then everything changed on March 15 when PCO and King beat Jay and Mark. 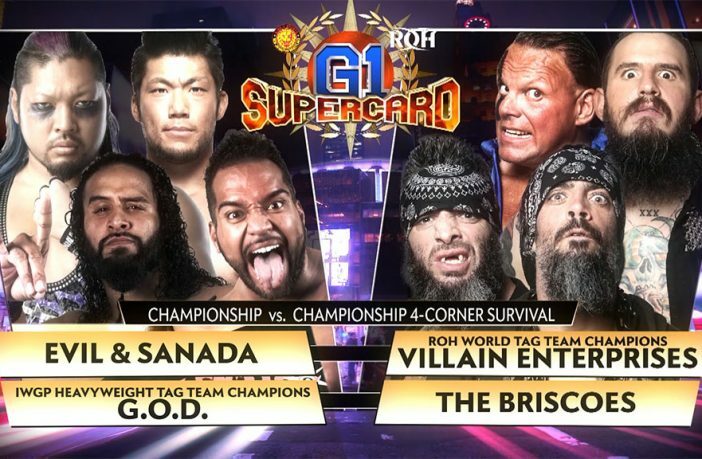 But the stipulation still holds and now both sets of championships are on the line, which means LIJ’s Evil and Sanada or The Briscoes, neither of whom are champions, could walk away with all the gold. 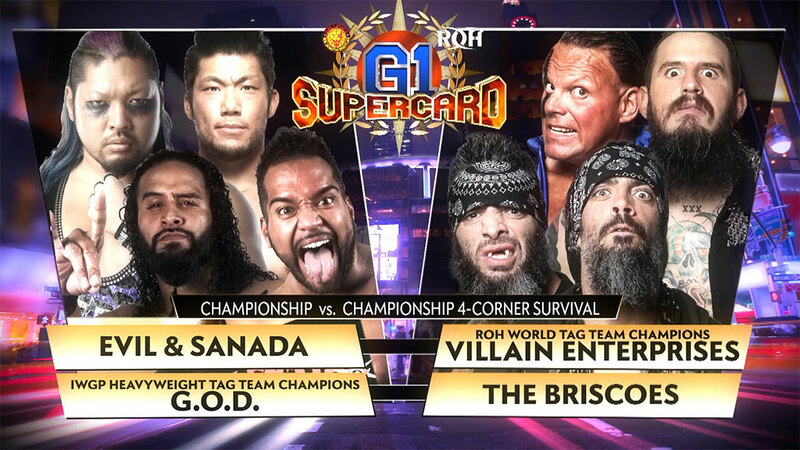 The G1 Supercard is indeed a huge night for both companies, as the event is taking place during WrestleMania weekend in WWE’s back yard. The event also features Jay Lethal defending the ROH World title against Matt Taven and Marty Scurll in a Triple Threat Match. The IWGP Championship will also be defended as Switchblade Jay White faces The Rainmaker Kazuchika Okada.